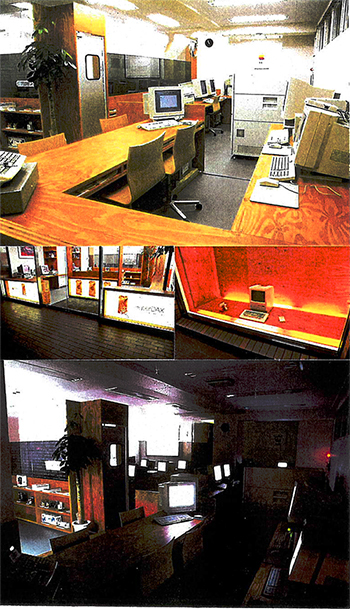 This time the client requested the interior renovation of the office they would move in after two years. The budget was again low and I was requested to complete the construction of the 100 times bigger area compared with the previous project with 4 times of the previous budget. This became my first extremely |ow—budgeted projects. Other requests were to re-use the facade glass of the previous project, and to provide a training room. The office space was supposed to returned to the building owner in the original state,so I did not deal with the existing finishes considering the budget. Basically all furniture and doors etc. were wood construction as I wanted to cut down on numbers of related manufacturers to reduce excessive costs. The main material is 24.5 mm thick plywood for subfloor,and I developed a way of assembly without inner frames or window frames. This material is very economical but has a very rough texture. So it was sandblasted three times during the point process of oil stain at the factory and the site.I designed the training so that visitors can observe their sessions from outside and in order to provide a comfortable silence and privacy I installed laminated glass (the same material as the previous project, partly recycled) at an eye level around the room. To cover the exposed edges of the glass I installed poly-carbonatepanels on the upper edges, which also became the window frames.